Going green isn’t just a lifestyle choice anymore. It’s a way to keep you, and the environment you live in healthier. No longer can we say that the world has infinite resources to feed us and sustain us. Much of the fishing industry has collapsed. Crop lands have been flooded or been subjected to drought. Natural water reservoirs have become polluted or redirected to sites far removed from water treatment plants. Farmland is being industrialized at an exponential rate. Energy needs continue to soar necessitating the construction of potentially dangerous nuclear power plants. Collectively, we are using up the resources of our planet–and fast. There is a way to help stave off the environmental impact of our lives. Each of us can play an individual role in helping to keep the world sustainable. As an individual, you can also help to protect your own good health–something that is likely far more precious to you than any environmental problems that might show up 10 or 20 years from now. 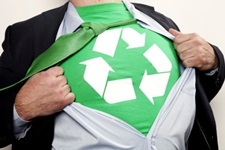 By living green in your own personal life, you can reap the benefits of treading lightly in the community you live in. Many of the common diseases that plague North Americans–such as cancer, diabetes, and heart disease–could be reduced by adopting a more green-friendly approach to everyday life. With that in mind, here are six easy steps to green living that you can start practicing today. 1. Make a grocery list. It’s estimated that the average household throws out about $40 of food a month. Take the time to plan out your meals and only buy the foods you need. Buy at bulk stores to reduce the amount of packaging you purchase along with your groceries. 2. Buy food locally. Get produce and other foods that have been grow or made right in your community. This helps to avoid having to use all the time, energy, and fuel it takes to ship apples from another continent, for example. Better yet, grow your own vegetables and fruits in the summer and fall months. 3. Wash your laundry in cold water. Washing machines are much better designed now than they were even 10 years ago. The performance of laundry soap has improved as well. It’s no longer necessary to “sterilize” laundry by choosing the hot water cycle. Almost all of the energy used by a washing machine goes into heating water. 4. Use solar heating. There are now incentives being offered by government agencies to retrofit a home or business with solar energy, helping to save you money and reduce your need for energy from your city’s power grid. 5. Install a programmable thermostat. For many in the U.S. and Canada, heating and cooling accounts for up to 45% of a home’s energy bills. You can save money and save energy by having your thermostat automatically lowered a few degrees during the day if you aren’t going to be home, for example. You can also lower your air-conditioning at certain “off hours” as well. 6. Update your appliances. Newer appliances will save you money directly when they use less electricity. Energy star appliances also help lower demands on the environment. Greenfield, P., et al, “50 Easy Ways To Be A Little Bit Greener,” Prevention web site; http://www.prevention.com/health/healthy-living/50-easy-ways-green-your-life, last accessed Sept 2, 2013. “101 Ways To Green Your Life,” Country Wide Homes web site; http://countrywidehomes.ca/homeowner-tools/101-ways-to-green-your-life, last accessed Sept 2, 2013.